By sampling the reflected isolated output voltage across the third winding on the power transformer, LT8315 requires no opto-isolator for regulation. 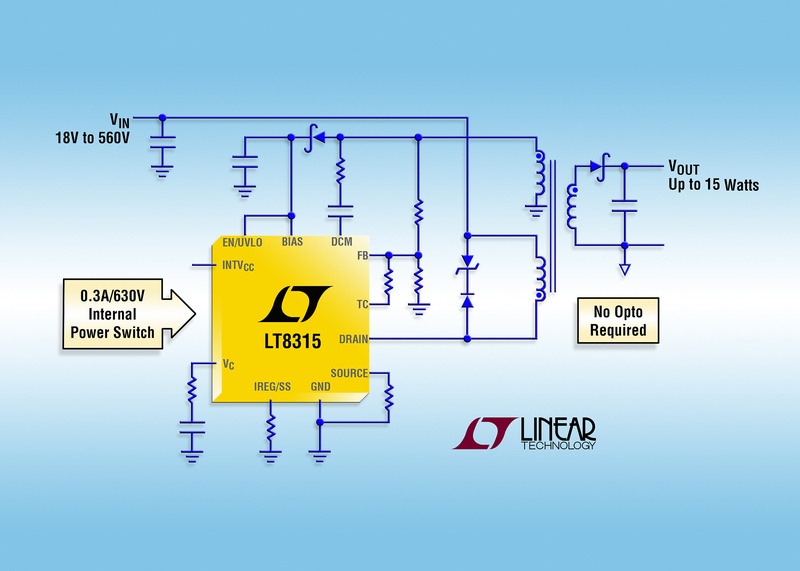 Linear Technology has introduced the LT8315, a high voltage monolithic flyback regulator that simplifies the design of an isolated DC/DC converter. By sampling the reflected isolated output voltage across the third winding on the power transformer, the part requires no opto-isolator or LT1431 for regulation. The LT8315 operates over an 18V to 560V input voltage range, has a 0.30A/630V integrated power switch and delivers up to 15W of output power, suitable for electric vehicles and battery stacks, as well as offline, automotive, industrial and medical applications. The LT8315 operates in quasi-resonant boundary mode that is a variable frequency current mode control switching scheme, resulting in better than ±1% load and line regulation. Boundary mode enables the use of a smaller transformer compared to equivalent continuous conduction mode designs. The level of integration and the use of low ripple Burst Mode operation result in simple-to-use, low component count and high efficiency application solution for isolated power delivery. Figure 1: LT8315 high voltage isolated monolithic flyback regulator. Additional features include output short-circuit protection, 70µA no load operating quiescent current, accurate enable and undervoltage lockout with hysteresis, along with output diode temperature compensation. Extended and industrial versions operate over a junction temperature range of –40°C to 125°C. A high temperature automotive grade operates from –40°C to 150°C.